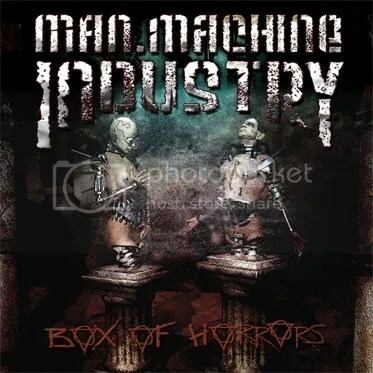 Man.Machine.Industry’s new album “Box Of Horrors” gives you a little of everything the band stands for – all strains of metal. Even though their sound has always been braided with an industrial thread, frontman Jhonny Bergman is a pretty old-school soul. I believe “Trend Killer” is the one song – not only in this album but in all M.M.I.’s discography – that mirrors it, thrashing away like there’s no tomorrow. Now “Let It Burn” has the aforementioned industrial twist to it, not compromising the aggression at all. It just adds some texture, that’s all. It’s go the same vibe of the previous (and my favorite) LP, “Lean Back, Relax And Watch The World Burn” and the chorus is catchy, not in a melodic way but in the sense that will make you want to scream along with it. Powerful! “20.000 Horns At The Sky” may not be as speedy, but its marching beat and groovy bass line make it quite belligerent just the same. As for the exquisite melodies that M.M.I. have gotten us used to, in songs like “Vivete et Sinete Mori” or “Colours”, take a listen to “Rise Above”. Plenty of melodic exquisiteness there. Living up to its name, the title-track is a creepy ballad, heavy on guitars. Some string arrangements, acoustic notes and somber choirs make a hell of a combination. I was surprised to hear another ballad right after this one, but “Destroyers Of Gods And Man” carries such a sadness and despair that you’ll put aside the slow pace and will keep in mind just its weight. The rhythm is spicy again in “Too Close To The Sun”, with hints of Arabian cadences. “Rise Of The Fallen” is one of those in-your-face kind of songs and the album closes up with yet another ballad, “Heading For Nowhere”, with some keys that somehow remind me of R.E.M. “Everybody Hurts”, so yeah, a ballad in the full sense of the word. So now you know what I meant by “all strains of metal”. “Box Of Horrors”, like its predecessor “Lean Back…”, is a diverse and solid album, better appreciated if listened to at a high volume.